The Los Angeles Dodgers Foundation (LADF) today announced 2018 cumulative grant donations of over $1.6 million to 70 local nonprofit organizations, which impacted over 600,000 underserved youth in some of the most challenged neighborhoods of Southern California. The awards are part of the LADF’s annual grants programs that provides funds three times a year to Education + Literacy, Health + Wellness and Sports + Recreation organizations. “Our city is full of amazing organizations serving youth who need help accessing resources and opportunities, thus leveling the playing field,” said LADF executive director Nichol Whiteman. 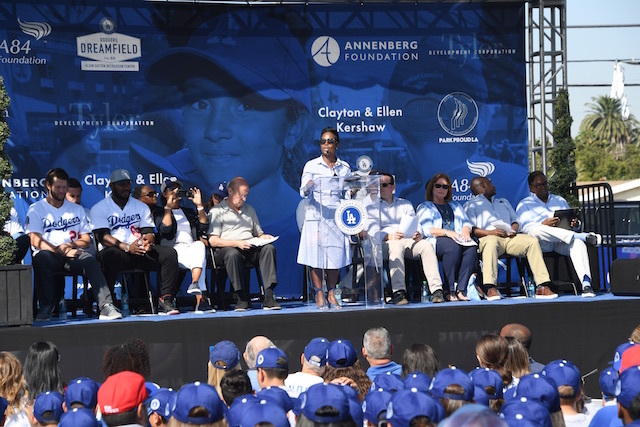 Along with this year’s grants, LADF invested nearly $2.5 million into its 2018 direct programs: Dodgers Dreamfields, Dodgers RBI (Reviving Baseball in Inner Cities) and LA Reads. The 50th Dodgers Dreamfield was opened in September, completing a 15-year promise. Since inception, the Dodgers Foundation has distributed more than $25 million in programs and grants to hundreds of organizations across Los Angeles through the generous support of donors and fans who support LADF by purchasing a 50/50 raffle ticket, bidding on silent auction items, sponsoring events and providing general donations.